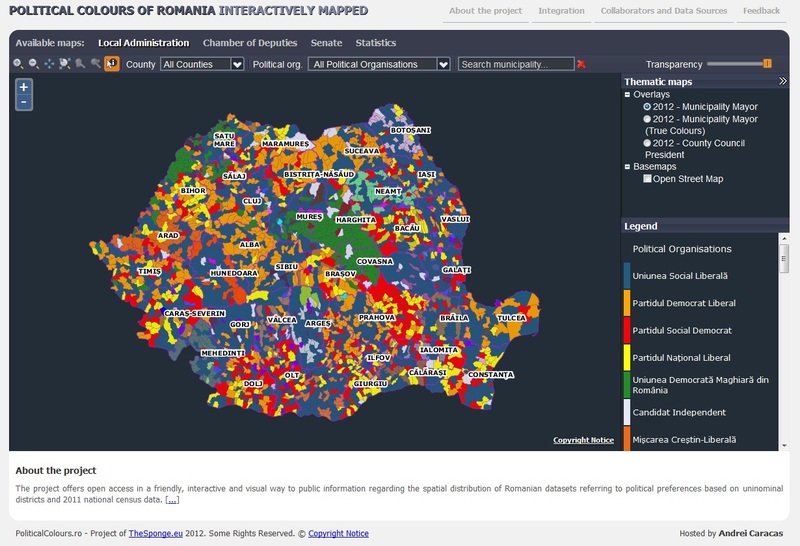 The project offers open access in a friendly, interactive and visual way to public information regarding the spatial distribution of Romanian data sets referring to political preferences based on uni-nominal districts and 2011 national census data. Further more, it allows the user to query the maps and to create it’s own thematic maps based on filters applied to attributes and/or geographical regions. There are four main predefined categories, Local Elections, Chamber of Deputies, Senate and Statistics that allow a clear view upon the political preferences, demographic and sociological dimension of the Romanian territory, from its’ smallest administrative division. The project Political Colours of Romania interactively mapped has been voluntarily developed by a team of nine members, with different professional backgrounds: Petru Zoltan, Zoltán Sipos, Bogdan Grama, Iulian Iuga, Vasile Craciunescu, Andrei Cipu, Cristi Draghici, Mihai Dumitru, Codrina Maria Ilie.